That's me singing my version of "In My Room" at the Connecticut Outreach Society's annual banquet last night. My thanks to the lovely Jan Brown for the photo. I will post a full report here about last night's adventure real soon now. Hi, Stana, can you get a video of you singing, I would love to see and hear you, you look fabulous. Lorraine --- Thank you for the "fabulous." No one recorded my performance, so I cannot post it. I see a recording contract soon you become the newest sensation!! you look like were and did have a lot of fun...that's what it's really all about! You can see the joy in your face and you look gorgeous! You look wonderful, Stana. Hope you had a great time. In the end (no pun intended) living our lives as we see fit and having a blast in the process is all that really matters to most of us. 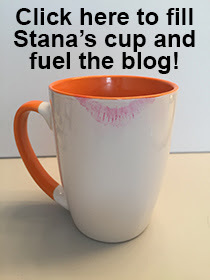 Kudos to you, Stana!